Nestled within a quiet cul-de-sac in Yaxley, Olivemede boasts a one and a half acre site complete with maintained gardens and houses 32 single en-suite rooms spread over two floors. For wheelchair users there is a lift available and a rear entrance path for 1st floor access. The bedrooms we offer are fully furnished but residents are welcome to bring their own belongings with them – many of our residents find it helps to add sense of familiarity and really make the room their own. Each floor has its own kitchen, laundry, sluice, shower room, communal lounge and dining area. We also offer hoist assisted bathing. A hairdresser routinely visits Olivemede each Tuesday and Thursday, alongside this we receive regular nurse visits and professional chiropodist care is available to our residents. Our trained chef and kitchen staff provide excellent meals with a healthy dose of variety, flavour and nutrition. 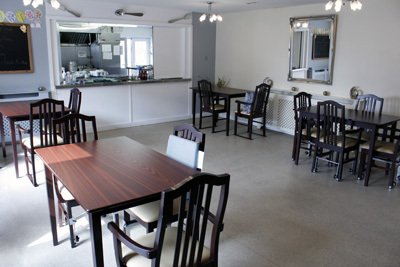 Attached to Olivemede is our independent Daycentre which attracts daily visitors and also offers regular entertainment and events to the residents of Olivemede. In addition to this we encourage our residents to partake of day trips to various local events, such as the Holme annual 1940s weekend. The results of our most recent inspection by the Care Quality Commission can be found here. Rooms are available from £550 a week or £79 per day.